Hello there! Glad to meet you. Welcome to the wonderful world of Pokémon! They call us the Super Fun Pokécostume Professors and we’re here to guide you through the exciting transformation. What? You are ready to pick your starter Pokémon? Well, you are certainly welcome to do that. We have plenty of resources available to help you acquire all sorts of the many creatures throughout the world. But, we have the limited availability today to offer you something even better! We can transform a human into one of those delightful critters! How exciting!? Surely you’ll find this even more interesting. After all, rather than chatting with a Professor, picking your starter, and then learning how to battle in the tall grasses, you can learn the wondrous details of your favorite Pokémon through a series of tests of practical application with your Pokémon pal. All we need is to get a few details down and we can ship you out the transformation kit and you will be on your way to fetching all the best candies and jealous stares from others who only have little, miniature stuffed versions of Pokémon! This Deluxe Pikachu Costume transforms your child into the one and only Pikachu! 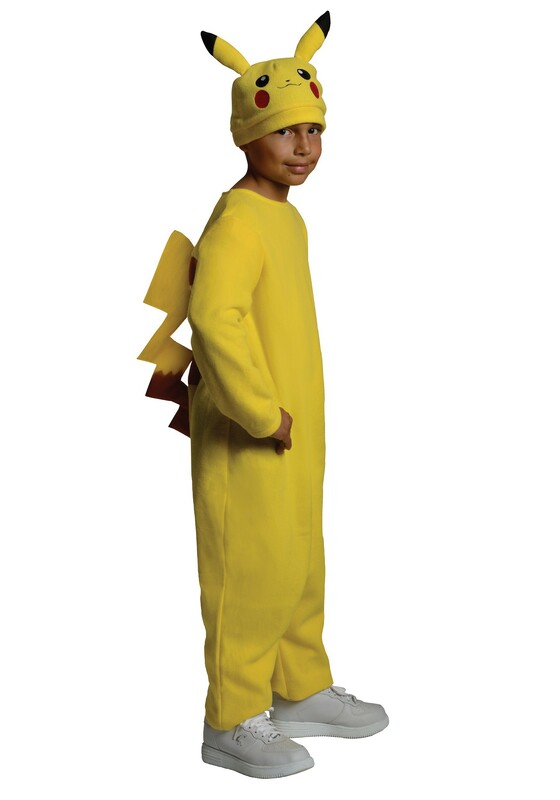 The costume jumpsuit fits great thanks to the mystery of Velcro closures and gives your kiddo the brilliant yellow of everyone’s favorite electric mouse type Pokémon. The matching cap comes with the little red cheeks and adorable ears on the hood, so your little one will be ready to electrify the competition with this cute new look. The next time you run into a Pokemon trainer, you can proudly shout, “Pikachu, I choose you!” and your child will be ready to jump into action! Of course, you'll want to keep your kid away from any ground-type critters lurking around, since electric attacks do nothing to those guys!